Music Choral Risers and Portable Stages Music Gifts | Dance Gifts | Music Treasures Co.
All our choral risers and stages manufactured by Midwest Folding Products offer outstanding value and durability. All key components are manufactured in the USA in the same factory maintaining high quality at the lowest possible cost while assuring close control of delivery time. You can expect the equipment you buy from us to endure many years of rough use. Midwest Folding Products designs durable, high quality products that out perform all other brands and exceed your expectations. Safety is built into every feature with sturdy decking reinforced by 16 gauge steel channel frame and 14 gauge leg tubing braced with spring bolt locks. Staging is UL tested for 200lbs. per square foot of load. All units carry a 10 year manufacturer's warranty. With a wide variety of configurations, color, and style we are sure to have the riser or stage that will perfectly meet your need. Modular design allows flexibility to vary the number of levels to suit the specific needs of each performance. Available in tapered or straight sets with a variety of deck finishes and colors. Midwest portable stage and seated riser units offer the best value on the market today. Platforms may be ordered in the same height to assemble a performing stage, or they may be ordered in up to 5 different heights to construct seated band and choral risers. Units fold to store in less than 2" in height each when stacked. 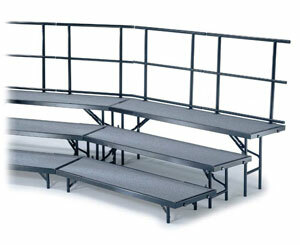 Dual height models allow easy conversion from seated risers to performing stages when needed. Units are constructed of heavy gauge steel and laminated plywood core decking for unsurpassed safety and durability. Contact Us for exclusive Music Treasures Internet Pricing!